Is there a short-term solution for India’s backlogged courts? Is India’s judiciary on the cusp of a crisis? Listening to Tirath Singh Thakur, the chief justice of the Indian Supreme Court, speak on Sunday it appears so. Thakur delivered an impassioned and emotional appeal, directed at Indian Prime Minister Narendra Modi, suggesting that India’s apex court was woefully under-equipped to adequately address the number of cases it had pending. 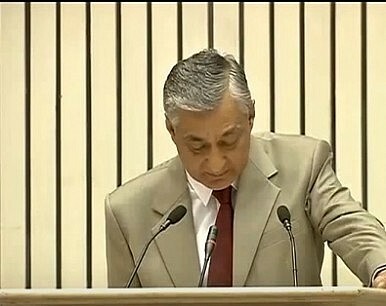 Thakur was addressing the Annual Chief Ministers and Chief Justices Conference. The emotional nature of his speech–Thakur broke into tears several time during his 30-minute speech–has captured headlines in India, highlighting a long-standing problem. Indeed, the problem has been well-known for some time. India’s last government acknowledged that the country had the world’s largest backlog of pending court cases. While Thakur primarily spoke for his court, the Supreme Court, the broader problem of an overburdened judiciary extends across India’s national court system. A stunning report in 2009 by New Delhi’s high court noted that, at the rate things were going, the existing backlog of cases would take 466 years to clear. Estimates as of 2013 noted that around 30 million cases were pending in Indian courts–some of these cases have been pending since India adopted its constitution and became a Republic in 1950. “I feel that if nothing else has helped justice, an emotional appeal might,” Thakur told his audience on Sunday, according to The Hindu. “Therefore not only in the name of the litigant… the poor litigant languishing in jail but also in the name of the country and progress, I beseech you to realize that it is not enough to criticize the judiciary… you cannot shift the entire burden to the judiciary,” he added. Thakur laid bare the scale of the statistical challenge facing the Indian judiciary in plain terms: the average Indian judge dealt with 2,600 cases a year while the average judge in the United States handled just 81. To convey the severity of the problem, Thakur brought up the Modi government’s governance agenda. When Modi’s Bharatiya Janata Party (BJP) prevailed in national elections in 2014, it did so partly due to its emphasis on good governance and anti-corruption in its campaign rhetoric. Moreover, in his first two years in office, Modi’s cabinet has implemented important liberalizing reforms and launched various campaigns to draw foreign direct investment to India. (These campaigns have paid dividends, as one recent report found.) Thakur questioned what good the Modi government’s signature “Make in India” and related pitches meant without a robust and capable judiciary. The problem facing the Indian judiciary appears to have gotten so dire that there aren’t easy policy prescriptions to fix the problem in the short-term. The most obvious solution–hiring more judges–has been tried before, with little success. In 2008, the Indian Justice Ministry, acting on a recommendation originally made by the Law Commission in 1987, said it would aim to have 50 judges per million people by 2013, a target it failed to reach. Moreover, the judiciary, like the rest of India’s central and state bureaucracies, isn’t immune from the negative effects of corruption. As Ram Mashru explained in The Diplomat in 2013, another problem is India’s federal structure. “The responsibility of dispensing justice is split between New Delhi and the states, and the latter are responsible for employing and paying new judges,” Mashru wrote at the time. The structural reforms necessary range from the modest (increasing working days and the length of court sittings) to the more complex (increasing overall efficiency and transparency). Modi, who was in attendance during Thakur’s speech, was moved to deliver an impromptu response, according to The Hindu. The Indian prime minister stressed that he recognized the urgency of reform and would work to reduce the existing burden for the Supreme Court and the judiciary more broadly.